About Aristoteleia N. Message Aristoteleia N.
We are family of four with two teenage daughters. Our tour guide Aristoteleia on time & was excellent . She explained the relevant historic details to keep all of us interested. She also gave us enough time to look around always gave a hand in the photographs. This tour usually starts from Kalamata , but we started in Sparta , hence there was additional time which was well used as we were also able to visit Mystras monastery. Overall the tour was highly satisfactory. TOUR GUIDE RESPONSE: Good morning Dr. Asunga and the beautiful family. Thank you for your time and I hope to see you again one day soon. Do not forget to send me our photo. Friendly friendly regards Aristoteleia N.
Teleia is fluent in English, knows Greek history very well, and is personable. It was a delight to spend 4 days with her. She is not a licensed guide, so she would tell us the history of an ancient site while driving there and then let us see the site on our own while she waited outside. Signs are in English, and this was even better than having a licensed guide with us, as we did on 3 other days. I am not sure that the visit to the honey farm was worth 50 Euros, though. You may want to skip that. TOUR GUIDE RESPONSE: Good morning dear Mr. Hicks Thank you very much for all these good words of yours and I appreciate your review about the Honey farm. You are absolutely right about the cost and we will take care of this a.s.a.p.! Merry Christmas to you and all your family. Aristoteleia N.
Aristoteleia and the tour she had planned was hands down the BEST EXPERIENCE. My group of 10 ppl who only had a few hours till we had to be back on the ship in the middle of November, seriously couldn't have been happier with the tour we picked with Teleia! She was on time, ready, communicated perfectly and was fun to be around. The bee keeper, Olympia, and the winery are a must! My favorite tour/day of our trip. If you are going to Katakolon, Greece look no further....BOOK THIS TOUR NOW! Tellei was a great guide for our brief time off the cruise ship in the port of Gythion. Her English is excellent, she was entertaining, and a great driver, and very knowledgeable about Greek history. We spent out time in the medieval town of Mystras, and then she recommended a place by the wharf for us to sample authentic Greek "street" food for a late lunch. We thoroughly enjoyed the time we spent with her, and highly recommend her as a local guide. She was so kind. Always smiling and making sure we were learning about her Country. Highly recommend. She is an excellent guide. Knowledgeable, interesting, and very entertaining. We highly recommend her. She was prompt, personable and flexible. Aristotelia picked us up (5 adults) from our villa in the hills near Kalamata for our full day tour. She told us stories on the 2 hour drive to the Olympia site, offered options for how our day was to proceed, willingly listened to our suggestions. Our "side" options to visit a winery and apiary turned out to be the highlights of the trip - spending time with our guide was the best! Aristotelia quickly understood our sense of humor, and her English was excellent. TOUR GUIDE RESPONSE: You were the best company ever!!!!!!! Return back whenever you want!!! Now you have friends in Greece! TOUR GUIDE RESPONSE: Thank you very much Mr. Gary!!! Aristoteleia was fantastic & provided a wonderful experience for us during our recent visit to Monemvasia. I would highly recommend her & very much hope to tour with her again one day. TOUR GUIDE RESPONSE: Oh, thank you Mrs. Tracey, You have been a wonderful company. Have a nice day. Aristoteleia N.
Telia was a wonderful guide for our family of 7 (ages 9 - 70). She read our group beautifully and adjusted the tour accordingly. She gave us a wonderful overview of Ancient Olympia on our drive there, and waited patiently while we took our time exploring. Per our request, she found us the most beautiful beach and we all enjoyed lunch and a wonderful afternoon swimming in the bluest waters. Telia is very knowledgeable about Greek history, and she truly loves her country. Highest recommendation! TOUR GUIDE RESPONSE: The most beautiful family ever came in Greece. Thank you for your smiles and your kindness! Thalia was a wonderful and informative host to our visit in Olympia. She was a wealth of knowledge on the history of this region in Greece. She also brought us to Clio's honey farm which was a true jem with beautiful authentic Greek hospitality. Thank you Thalia we definitely recommend you to anyone coming to visit Olympia! Best GUIDE EVER Extremely personable down to earth honest real and relevant knowledgeable helpfully kind and accommodating! Would have her guide me around the world if possible! TOUR GUIDE RESPONSE: Happy New year mr. Galligan. Thank you so very much for your kind kind words but also for your smiles and your kind behaviour which was very much appreciated. It is my turn to say that you were such a joyful company that I could guide you anywhere around the world!!! Friendly friendly regards Aristoteleia N.
We had a marvelous day! Getting away from the port and other tour groups, we had a comfortable drive through the countryside. We started at the top of the ruins and then walked down to our awaiting guide. We then had a nice lunch in Sparta before returning to the ship. It appears that the cruise ship tours only take people to the bottom of the ruins with half the time to visit and they never got up to the castle or saw the view. So this TBL tour is the way to go. Our guide was helpful and friendly. TOUR GUIDE RESPONSE: You are more than welcome. Thank you for your smiles and kindness! Hope to see you again, one day! Friendly friendly regards Aristoteleia N.
Our day in Mani is forever imprinted on our minds. Aristoteleia is responsible for making the tour so perfect!!! Traveling through and stopping in the picturesque towns -- plus learning the history and customs of the area -- just fascinating!! My interest in Mani was piqued by reading Fermor's book "Mani"...and Aristoteleia researched the exact location of his home for a visit. She went above and beyond. Thank you, Aristoteleia. Aristoteleia was outstanding!! We couldn't have asked for a better Tour Guide. If any one is looking for that extra special touch and bonus with their tour, hire Aristotleia and don't look back! You will be in store for the tour of a life time! TOUR GUIDE RESPONSE: You gave me tears to my eyes!!! All four of you were so kind!!! You let me feel that I was a part of your company!!!! Thank you so much!! Teleia is a very responsible and reliable tour guide. On our way back to Athens airport, I asked her to find a wonderful winery to visit as I had heard about the progress many of the Greek Wineries have been making in recent years. Great Visit and tour of the Winery in the Nemea region was fantastic. Teleia is very accommodating, flexible and willing to go above and beyond to customize the perfect tour for you-Highly Recommend her! Teleia is extremely knowledgeable. She provided me with an excellent overview of this very ancient city-a beautiful place to visit and would highly recommend her and this tour. Excellent! TOUR GUIDE RESPONSE: Hey Jane, Thank you again for your nice review. 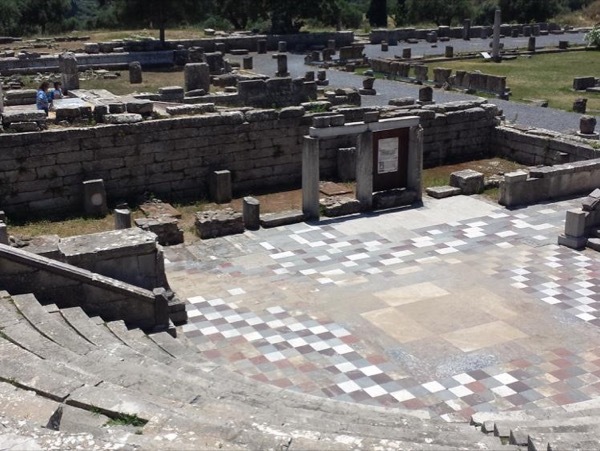 You understand that Messene is my favorite tour as each and every time I feel like returning home to my "grandfathers". I am so happy that you liked it too. TOUR GUIDE RESPONSE: Dear Jane, thank you so much! I had a great time that day too!Come back and I will take you to all the places we did not had the time to go! Teleia is extremely professional and very well qualified as a tour guide and would highly recommend her. She arrived promptly as promised, had a very comfortable and nice car-excellent driver. I was in Great Hands with Teleia and safe. Her knowledge regarding the greater Kalamata area was outstanding-Great Tour! Telia welcomed us with a great smile despite us being very late to our meet up. She was most accommodating and gave us extra time to have our lunch before the guided tour. Many thanks Telia! Telia was such a great guide. Luxury car including cold water on arrival. Very good person to talk about all things Greek not just the tour. A bubbly and friendly personality with much character you will be sure to have an amazing day with her. TOUR GUIDE RESPONSE: Dear Steven, Thank you for sharing with me your precious time of vacation! All three of you, gave me a beautiful day to remember! ....and laugh!